If Only I Could Pick Colors in Shape Data Fields! I wanted to allow users to pick colors for various parts of shapes at the same time that they specify other values: namely when they are editing Shape Data fields. Previously, I had bastardized the foreground and background colors, and even shadow colors to allow users to benefit from built-in color picking interfaces. See Sankey Diagram Shapes for Visio, and Automatic Chevron Process Shape for examples of this. It works, but it isn’t immediately obvious to the user. Other times, you have to expect user to sub-select sub-shapes, then format them individually. This can be annoying, because they might not know how to sub-select. 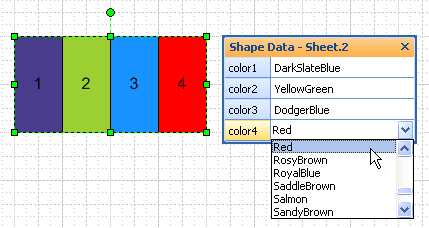 Also, if your shape has data fields anyway, why not set all variables in one place? So why not allow color to be one of the available Shape Data types? Since Visio is so customizable, you find yourself pushing it all the time. And when you push enough, you end up against a wall, such as this one, with “no color picker shape data type” spray painted all over it. But that same customizability allows you to come up with workarounds, time and time again. This time, the next best thing was to create a drop-down list of named colors. While visual pickers are nice, text drop-downs offer the consolation that you can quickly navigate them by typing the first letter of the color you are searching for. And today’s example has 140 different colors, so that quick navigation is nice to have. So now you just need to learn and memorize what colors like: “Dark Goldenrod”, “Lavender Blush” and “Powder Blue” actually mean! Which yields a reddish-brown color. 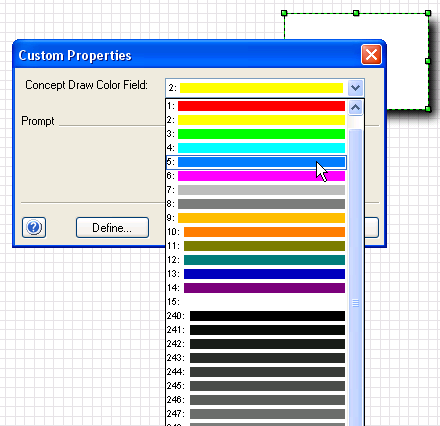 We can then make a list of RGB formulas, and a corresponding list of names for those colors. The LOOKUP and INDEX ShapeSheet functions can then be used to transform a name into a color-formula. The first two cells are self-explanatory. User.colors, however, is a bit more complicated. 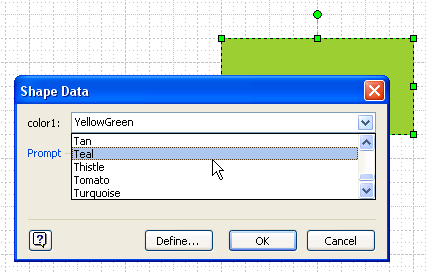 You’ll notice that it references a Shape Data field called Prop.color1.This contains the value that is selected by the user in the Shape Data window. Once we have a name, we find it’s position in the name list using LOOKUP. Then we grab the RGB formula from the other list using that position as an argument to INDEX. Note that Prop.Color.Format could just have easily contained the full list of names. But I put it in User.colorNames, so that it would be available for multiple fields. More on that later. I actually came to the idea of using color lists while working on another project, in which I was coding in C#. When you use the .NET framework, you can choose colors from built-in set, defined in the System.Drawing namespace. // Copy the Output for use in a Visio shape's ShapeSheet! This allows me to define the logic for looking-up and indexing color names and color values in one central place. I can then re-use it multiple times without proliferating copies of that logic. 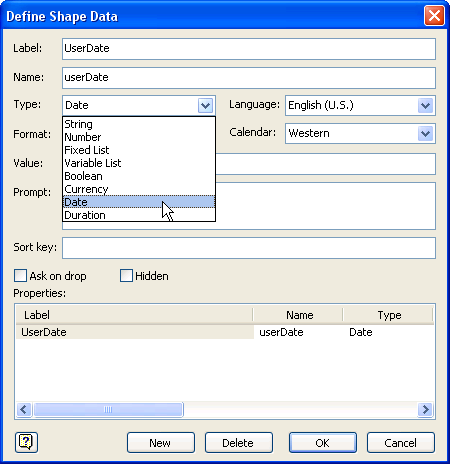 If you’ve read User-defined ShapeSheet Functions in Visio 2007, then you’ll understand. If not, go have a look! 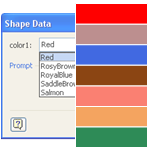 There are four corresponding Shape Data cells that expose the data to the user: Prop.color1, Prop.color2, Prop.color3 and Prop.color4. You can see that by using EVALCELL to call the custom function, I only have to change one argument. If I ever modify my color-lookup-logic, I will only have to change one formula: User.colorFunction. 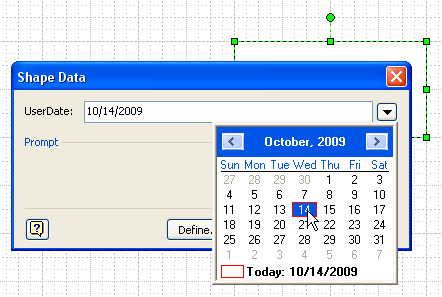 Pretty neat, and only available in Visio 2007 or later, by the way. If you set up these User-cells and Prop-cells in a group, then it is easy to have sub-shapes reference the values. Suppose your group has an ID of 5. This means your group can be referenced by the name “Sheet.5”. The download contains a single shape and a group shape, both armed with big, long drop-down lists of colors, ready for you to use in your own projects, or pick apart and learn from. Have fun! That would save so much time, and provides so much more flexibility! Of the various shapes that I’ve provided a color selection option — what a pain to have to code those into the shape sheet manually. I am thinking of creating some sort of tool or Excel spreadsheet that allows you to easily select sub-sets of those 140 colors so you can easily build the necessary ShapeSheet functions with shorter lists. After all, how many people need ‘Rosy Brown’ or ‘Thistle’, let alone know what they look like? using Shape Sheet functions for this, is a great idea. I used a method with Color choosing in the Shape-Data window, too, but used the Dependson-Function to change LineColors via SETF, whenever an new color was selected in the Shape-Data-Window. The Index/Lookup-combination is clever,too. I used many If-Functions. That was OK, when you can only choose between 4 colors, but for 140 colors that would have been akward. Therefore I’ll use your method in the future. But what impressed me most, was a small thing: The Color-Symbol in the Kontextmenu of the shape. How did you know the nessesary ButtonFace number? Is there a list with pictures and IDs on the internet somewhere? Or is there an easy way to find Visios Icons and their number? The ButtonFace IDs is something I have wanted to write about for a while, but there are a few things that I still wanted to research. You’ll now have an array of shapes with incremented ButtonFace ids, and you should be able to easily see which icon corresponds to which number. Used Step 1-4 from above to create a shape. I created a new stencil and called it ButtonFace. Then I put the Shape in the new stencil as a new master and called it BF. Then I wrote this little VBA-Sub which constructs a small table with ButtonFaceIds from 0 to 1000. When you change the 0 in the first row with Shp.Cells… you can define another start number. So if you exchange 0 with 1000 the Sub will produce a list with ButtonFaceIDs from 1001-2000. I just want to create a new shape with the function you described here. I remembered your article and tried it out. 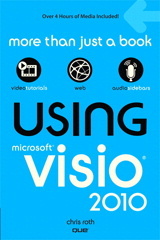 At the moment I use the Visio 2010 beta and the result was: Black. All the time the shape was colored black. When I refer to the cell User.Color Visio always puts a “0” as value?!?! Do you know what the problem can be? Hi eLiz, there seems to be a problem with German systems, and I haven’t had the time to play with Visio-DE. There may be a simple fix for this, I just don’t have time in the next few weeks to research auf einem deutschen Rechner. Is there a workaround for the german version problem yet? Sorry, but your trick doesn’t work in Visio 2010 (Russian). A element’s color has changed to black after I choose another color in a list. In the same time value in user’s cell containing a color (for example, User.color1) has a right value, but value ‘FillForegnd’ = 0! It’s a problem with the list separators. In the US it’s a comma, in Europe it’s a semicolon. This gives us something like 250,235,215 to work with. Note: the blog software will mess up the quotations with the fancy 66 99 style quotes. You’ll have to replace them with the simple double-quote characters when you copy-paste into the ShapeSheet. Although I am not well educated in using a Shapesheet, I did try to use your solution, starting with one color. Alas, the shape showed no color. Could you indicate what went wrong? It’s probably due to you having Dutch(?) regional settings, where the normal list separator is a semi-colon instead of a comma. It’s something like you are getting RGB(255,0,0) returned from index/lookup ShapeSheet logic, but you really need RGB(255;0;0). Although the ShapeSheet should really be “universal” (=USA), there seems to be a problem in this area. Thanks for your response. After I followed your comment of February 6, it did work. Another error I made was trying to modify a grouped shape. the workaround described above February 6 2013 is ok, but requires a lot of modifications to the shapesheet. and the “choose colors with Shape Data Fields” also works with German installation. Thanks a lot for all the usefull infos on your pages, Visio Guy! I generally put my user-defined functions into user-defined cells, and preface them with an “f”.